Vyacheslav Agapov and Konstantin Chiliskin were unsuccessful, amateur treasure hunters from the Kaluga Region of Russia, who were searching for buried coins with a metal detector in Velino Village. Behind the long standing Velino Church, built in 1772, they struck pay day, or more accurately a jewel studded pot that contained religious icons. On the side of the pot was an engraving that read: ““Property of Velino Church”. Both men immediately felt uneasy about the previous owner of their big find. After all, ancient Russian armies are one thing, god is in a league unto his own. But Apapov and Chiliskin did not let their apprehensions stop them from calling a friend named Roman, who immediately contacted antique dealer who offered the treasure hunters $20,000 for everything they had, no questions asked. Moments went by as Roman, Agapov and Chiliskin tried to decide what to do with their loot, then apparently god stepped in to assist in their decision making process. Roman reported hearing a mysterious voice and feeling someone hit him on the back of the shoulder repeatedly. 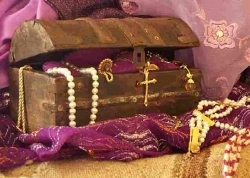 After this incident, the group decided it might be best to return the religious relics to the church. I am trying to trace the Apapov family.